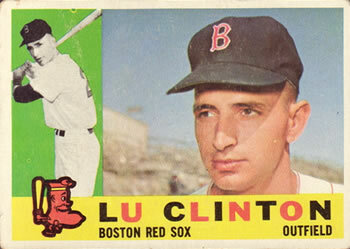 Lou Clinton played right field in 603 of his 691 major-league games. He played for five different teams over parts of eight seasons, but the lion’s share of his time was spent in the organization which first signed him, the Boston Red Sox. Signing him to the Sox in 1955 was fellow Oklahoman, scout Danny Doyle. Clinton was born in Ponca City, Oklahoma, on October 13, 1937. His father, Earl J. Clinton, and family lived in Longwood, a township pretty much adjacent to Ponca City in north central Oklahoma. Ponca City itself was a relatively small city, with fewer than 17,000 people. Earl Clinton worked as a quarryman in a local rock quarry. Some years later he became an employee of Continental Oil even after the company moved head offices to Houston (Conoco had its headquarters in Ponca City until 1949.) He and his wife, Lucy (Marlette) Clinton, were both Iowa natives; she came from a farming family. He attended the Ponca City schools, first Washington and then Ponca High. Right after high school graduation, still 17 years old, he was signed by Doyle and sent to play for Bluefield, West Virginia (Class-D Appalachian League). He quickly showed he had the talent to advance. hitting .361 with 19 home runs in 75 games, and near the end of the season was sent to Greensboro, North Carolina, to play for the Patriots. In 18 games, he hit for a .303 batting average. In 1956 he spent most of the season with Greensboro, batting .243 in 90 games. He homered 15 times. In six games for Albany in the Class-A Eastern League, he hit .333 (7-for-21). His entire 1957 season was with Albany, playing in 137 games, batting .253 with 12 home runs. Clinton’s 1958 and 1959 seasons were both spent with the Minneapolis Millers, the Triple-A club of the Red Sox. He hit for an identical .251 both years, though with more than 200 additional at-bats in 1958 and 20 homers compared to just six home runs in 1958. In both years, the Millers won the American Association pennant. In 1958 they swept the Junior World Series from Montreal, the winner of the International League pennant, and in 1959 they lost in seven games to the Havana Sugar Kings. In between the two seasons, Clinton had married Eleanor Sue Thompson on October 18, 1958. Clinton hadn’t hit for a big average in the minors but he was considered very good defensively, and at the very end of March was informed that he had made the big-league team. He was seen as a possibility to play right field.3 Clinton was 6-foot-1, and listed at 185 pounds. Clinton’s big-league debut was a good one to remember. On April 22, 1960, in Washington, the Red Sox won in 11 innings over the Senators and Clinton was 3-for-5. He singled and scored the tying run in the ninth. One advantage was that he hit right-handed. He and Bobby Thomson were the only two in the Red Sox lineup that day who did. He was 0-for-3 the next day, but collected his first run batted in on a groundout producing the first run of the game. And on the day after that, he hit his first homer, off Camilo Pascual. Gary Geiger, who had taken over right-field duties for the Red Sox, suffered a collapsed right lung on July 28. Clinton was called back from Minneapolis, where he had hit .258 in 35 games. Clinton played out the rest of the season, but less successfully than in the first half. He wound up the year with a batting average of .228 with six home runs and 37 RBIs. There had been one notable incident in the August 9 game in Cleveland. Bill Monbouquette was pitching and Vic Power hit a long drive to right field. It was hit over his head but Clinton was ranging back to try to catch it when “the ball hit the top of that pipe and bounced back toward me and as I’m taking a step I just kicked it out of the ballpark. I went in and argued that it hit the ground first, which then it would’ve been a double, but the umpire didn’t buy it.”5 He’d booted the ball out of the park, a two-run homer with — one could say — an assist from Clinton. After the 1961 season, Red Sox right fielder Jackie Jensen announced his retirement. Johnny Pesky was named manager of the Red Sox and led the team in 1963 and 1964. Clinton worked nearly the whole 1963 season, in 148 games. He hit 22 homers, with 77 RBIs, but his batting average dropped to .232 and he was benched for most of two weeks late in July. Maybe he was just swinging for the fences more; his strikeouts ballooned from 79 to 118. Clinton’s June 5 debut at Dodger Stadium (where the Angels played, too) was a success, 3-for-4 with a two-run homer in a 3-2 win over the Yankees. He won another game for them six days later with a 12th-inning sacrifice fly. On July 3 he homered in the top of the 10th to help the Angels beat the Red Sox at Fenway Park and homered the next day, too. And his 10th-inning homer on September 12 beat the Red Sox again, in Boston. That said, he hit about the same in 1965 with the re-named California Angels and had a .243 batting average through September 6, with — astonishingly — only eight RBIs in 249 plate appearances. He put on his third uniform in a 48-hour period—and in his first game made two errors for Cleveland, helping the Tigers score a 2-0 victory. In 12 games, he drove in two runs for the Indians, batting .176 (6-for-34). On January 14, 1966, Cleveland traded him to the New York Yankees for catcher Doc Edwards. In 1966, Clinton played in 80 games for the Yankees, with 159 at-bats, driving in 21 runs while batting .220. The Yankees finished the season in last place. He started the ’67 season with the Yankees but fractured his right thumb during spring training. He was 2-for-4 in six games (five times pinch-hitting — even with his broken thumb — and once as a defensive replacement), with a pair of RBIs, but on May 11, when New York had to pare down to the 25-man limit, his contract was sold to the Philadelphia Phillies, who assigned it to their Triple-A team in San Diego. It was his last season in baseball, and he played in 110 games, batting .250. He was an important force for the San Diego Padres in the Pacific Coast League playoffs; over the first five games, he had a .421 average with three homers and seven RBIs. He doubled in the sixth game, and the Padres won the pennant, beating Spokane four games to two. He had worked with his uncle for a few years and then branched out on his own, establishing himself as owner and operator of Clinton Production Inc. in Wichita, Kansas. After his passing, his son. Chris Clinton, took over the company. The company today works with oil well machinery, equipment, and supplies. Clinton’s death was noted in the Wichita Eagle with an obituary entitled “Luciean L. Or Lou Clinton, 60.”24 After a two-month illness, he died of pneumonia on December 6, 1997, in Wichita.25 Clinton left behind his wife, Eleanor, and their sons, Chris and Kevin, plus several other family relatives — his brothers Jim, Earl, and Loren, and sisters Lorene, Liz (Luciena), and Josephine. In addition to the sources noted in this biography, the author also accessed Clinton’s player questionnaire from the National Baseball Hall of Fame, the Encyclopedia of Minor League Baseball, Retrosheet.org, and Baseball-Reference.com. Thanks to Rod Nelson of SABR’s Scouts Committee. 1 Author interview with Liz Starrett on April 7, 2017. 2 “A sportswriter in Minneapolis insisted on spelling his name ‘Lu’ despite Cliinton’s objections. He wants it to be spelled ‘Lou’.” — Sid Ziff, “Call Him ‘Lu-Lou’,” Los Angeles Times, June 7, 1964: C3. 3 Associated Press, “Clinton gains Job with Fenway Hose,” Hartford Courant, March 29, 1960: 17. 4 Arthur Sampson, “Clinton Farmed, Muffet (sic) Called,” Boston Herald, June 23, 1960: 41. 5 Brent Kelley, “Lou Clinton,” Sports Collectors Digest, March 8, 1996: 150. 7 Fluffy Saccucci, “Bosox Outfielder Got A Good View of Maris’ 61st,” Sports Collectors Digest, June 19, 1992: 250. 8 Larry Claflin, “All Signs Point to Clinton As Top Hitter,” Boston Record American, September 19, 1962: 18. 9 Ed Rumill, “Clinton Fills Hole for Sox,” Christian Science Monitor, September 11, 1962: 10. 10 See, for instance, Larry Claflin, “Wilson, Clinton Seen As Trade Bait,” Boston Record American, October 4, 1963: 6. 11 Bill Nowlin, Mr. Red Sox: The Johnny Pesky Story (Cambridge, Massachusetts: Rounder Books, 2004), passim. 12 Larry Claflin, “Sox Clinton Reveals Shoulder Injury in ’63,” Boston Record American, January 16, 1964: 4. 13 Larry Claflin, “Yaz Eyes .330 — Hopes to Keep Title,” Boston Record American, January 22, 1964: 21. 14 “Higgins’ Tip Ignites Clinton,” Boston Traveler, April 1, 1964: 33. 15 Bill Nowlin, 231, 232. 17 UPI, “Clinton Hot at Finish,” Washington Post, May 17, 1965: D2. 18 Associated Press, “A’s Buy Lou Clinton,” Washington Post, September 9, 1965: D5. 19 Associated Press, “Indians To Get Clinton, Claim Of A’s Nullified,” Boston Globe, September 10, 1965: 42. 20 Joe McDuff, “A’s Angry at Loss of Clinton; Mixup In Asking Waivers,” The Sporting News, September 25, 1965: 29. 21 “Padres Study Realignment, Seek Catcher,” San Diego Union, January 29, 1968: 17. 24 “Luciean L. Or Lou Clinton, 60,” Wichita Eagle, December 8, 1997.